If you're visiting family and friends this summer, their home may not be totally saw for little ones. Hotels also pose plenty of potential hazards–especially for little crawlers! 1. Talk about safety :: As a guest in someone's home, you're more than entitled to discuss safety and security with the host and/or hostess. Find out ahead of time where you and baby will be sleeping. If you're uncomfortable posing questions, it might be a good idea to stay elsewhere where you can have complete control over your surroundings. 2. Bring your baby monitor :: You'll likely stay up later than baby, and you may end up out of earshot depending on how the home is set up. 3. Keep stairs safe :: If there are stairs where you're staying, bring a super-compact mesh stair gate or grab a cheap but effective wooden pressure gate (no hardware, tools or holes in the walls required!) for under $15 at Walmart or Target when you get into town. 1. Decide where baby will sleep :: The floor or an adult bed isn't safe. You can bring a portable crib or ask if your host can borrow a play yard from a trusted friend. If in doubt, bring your own! 2. Consider bath time :: If you're only used to giving baby a bath in an infant tub, do yourself a favor and pick up an inflatable baby bath tub before you go. My Mother-in-Law bought this adorable rubber duck tub when my son and his cousin were infants, and it's been perfect for the many times we stayed with the in-laws with infants. It's under $12 at Amazon, which is less than a fast food meal for two or a few gallons of gas! 3. Light up the room :: Bring a night-light so you're comfortable getting up in the middle of the night. It also might help baby adjust to her surroundings as she wakes up in an unknown room in a strange crib. Night-lights can be found at Dollar Tree and most other dollar stores, too! 4. Bring your own supplies :: I'm of the opinion that, as parents, we're responsible for baby's safety wherever we go. Of course, the host should tell you if there are any glaring or unusual safety issues, but everyday hazards like electrical outlets, windows and other issues can easily be taken care of with a small DIY babyproofing kit. Cabinet clasps, twist ties, zip ties and/or rubber bands to keep cabinet doors, curtains and window covering cords secure. Above all, it's important to remember that your baby or toddler will require extra supervision and attention regardless of the age, and regardless of where you're staying. Do your best to childproof the most obvious hazards, but you're the best piece of babyproofing equipment available for your family! 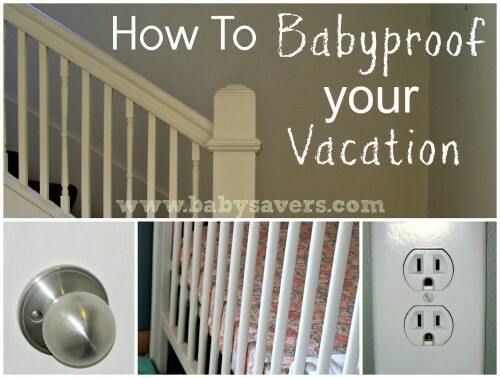 What other advice would you offer for babyproofing your environment on vacation? I have the perfect solution for your subscribers and followers. I know this is promoting ourselves but I couldnt resist telling you because it is so right for this blog. Checkout BabyProof App.